Last year, I had SO. MUCH. FUN with Chris Jameson’s Shark Island. It was everything I wanted in a shark book – a mix of horror, violence and gory shark action balanced with a great story and well-rounded, diverse characters. Imagine my excitement when I found out about Devil Sharks! It appears it’ll be a whole new story unrelated to Shark Island, but as long as there are rampaging sharks, I’m happy. I’ll be featuring this one a bit closer to the time as I just found out about it this week! Shark Island was great so I really want to read it AND it’s another great cover! I know! Shark Island was so fun, I’m so glad the author is writing another shark book. Haha – I love this title and cover. Sounds like horror and fun at the same time. OOh creepy!! Sharks have scared me ever since I saw Jaws as a kid! Ironically, I still love that movie. Other shark movies not so much. Too computerized! I did read Jaws eventually as well, I was “too young” for awhile according to my mom. After reading it I kind of understood why! Lol! Will have to keep an eye on this one though! Been ages since I read a shark book! I’m the same way! Terrified of Jaws when I saw it as a kid, but now I love the it! I rewatch it all the time. And yes, the book was definitely nothing like the movie, lol! I’m so thrilled to already have a copy of this one. I love shark stuff – especially in the summer and around Memorial Day (for some reason – maybe because that’s when they show all the Jaws movies on TV). Thanks for clearing up my question as to if this is a sequel. I had wondered but hadn’t checked yet. Oh cool! Also, I love series that aren’t really series. Meaning I could read this without reading the first one. 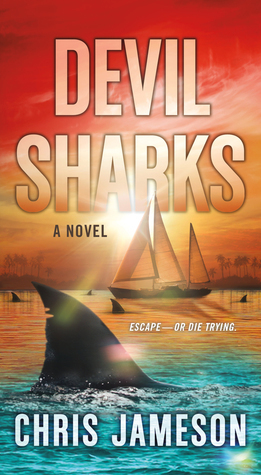 Can’t go wrong with killer sharks – both books sound awesome. I will have to check them out. Rampaging Sharks!!! How in the world did I miss these? I must know how this one is. Why does it come out so far away!! I have not read it. It also immediately went on the list. Now I just need to get me hands on a copy. Arrr! This is new to me! I feel like sharks are very misunderstood, mostly because of Jaws. 😐 Anyway I hope you enjoy this book when you get the chance to read it, Mogsy!